Air Traffic Controllers working at the NAV CANADA Area Control Centre (ACC) in Montreal have paid tribute to five hockey legends by naming new waypoints and arrival procedures after the former Canadiens. A waypoint is a specified geographical location, defined by longitude and latitude, that is used in the definition of routes and terminal segments and for progress-reporting purposes. Under the international convention, names must be unique and consist of five letters that are pronounceable. The five new waypoint names have been approved by the International Civil Aviation Organization (ICAO). "The Air Traffic Controllers at the Montreal ACC - which provides air navigation services for aircraft throughout Quebec and parts of eastern Ontario - and at the NAV CANADA Control Tower at Trudeau Airport are all very excited to be using the names of these great Canadiens as we guide aircraft arriving in Montreal," said Guy St-Arneault, Manager ACC Operations. To commemorate the event, NAV CANADA welcomed Mr. Lafleur, along with former Habs great Réjéan Houle, President of the Canadiens Alumni to the Tower and the ACC on Thursday. NAV CANADA also named a new standard terminal arrival (STAR) procedure HABBS ONE. "Most commercial aircraft, including the ones used by visiting NHL teams, will be flying the HABBS ONE procedure," notes Mr. St-Arneault. "That's pretty cool." 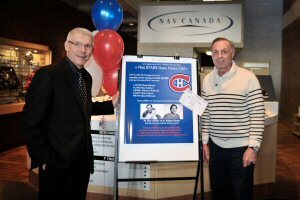 Rejean Houle and Guy Lafleur visit NAV CANADA's Area Control Centre in Montreal where Air Traffic Controllers named several aviation markers after Canadiens' legends.